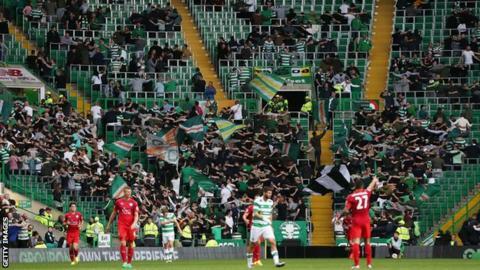 Scottish champions Celtic opened a standing section at Celtic Park last summer, which a report says will continue to be monitored. Premier League clubs agreed further talks on the possibility of introducing safe standing at grounds in November. Top flight and Championship stadiums have to be all-seater after terraces were outlawed in the aftermath of the 1989 Hillsborough disaster. Ninety-six Liverpool fans standing on the terraces died during the Reds' FA Cup semi-final with Nottingham Forest at Sheffield Wednesday's ground. The report - an annual update to the Department for Culture, Media and Sport's 'Sporting Future: A New Strategy for an Active Nation' - also highlighted that the Premier League had honoured their commitment to at least double their investment in grassroots football with at least £100m a year of funding.